Apple (Malus domestica) blossoms begin their blooming cycle pale pink, gradually fading to pure white as flowering progresses. A healthy blossoming tree can result in ample fruiting with proper care. Apple trees grow primarily in U.S. Department of Agriculture plant hardiness zones 3 through 8, depending on the variety. Hardy varieties generally grow in USDA zones 3 through 5, while long-season types are better suited for USDA zones 5 through 8. White apple blossoms grow on a tree. 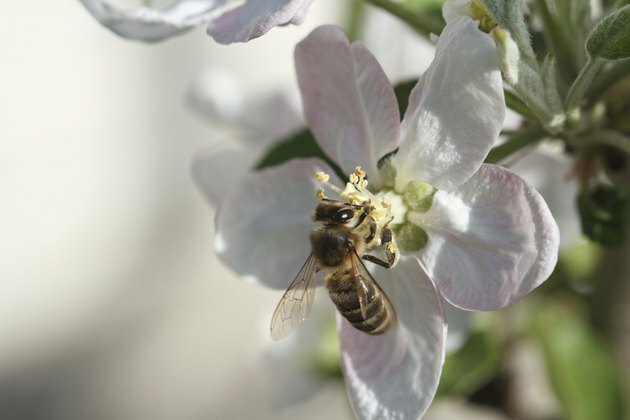 An apple blossom is pollinated by a bee. Apples set buds at the terminal end of 4-inch or longer shoots, or on shorter branches called spurs. Each bud cluster usually forms the same number of flower buds and leaves, but not all flower buds will be successfully pollinated to produce fruit. Each blossom has five petals. The blossoms produce a sweet scent that is faintly reminiscent of apple fruits, which helps attract bees and insects for pollination. Apple trees blossoming in an apple orchard. Apples flower from early spring to early summer, depending on the specific variety. Early blooming varieties, like "Pristine," are best suited to climates that rarely experience early or mid-spring frosts. In climates where the last frost date usually occurs before mid to late spring, a midseason variety like "Redfree" or "Liberty" is a better choice. If late frosts are a concern, select late-blooming varieties that don't flower until late spring or early summer, such as "Enterprise" and "Goldrush." All four varieties grow in USDA zones 5 through 8. 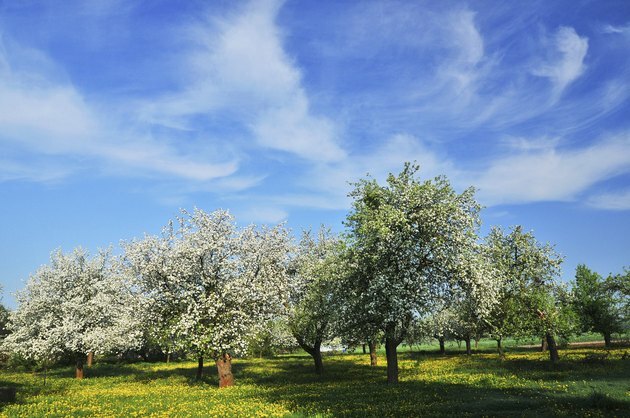 Frost causes the apple blossoms to drop without setting fruit, so you must select varieties known to bloom and fruit well in your climate. Ripe apples hang from a branch. The blossoms on a single tree aren't self-pollinating, and apple blossoms aren't successfully pollinated by other trees of the same variety. For fruit production you need at least two apple trees of different varieties that flower at the same time. Some apple blossom varieties are also sterile, including "Winesap" and "Jonagold," both hardy in USDA zones 5 through 8, which can complicate finding a suitable pollinator variety. To produce apples of these varieties, plant a pollinator variety that blooms at the same time as the sterile variety. The apples produced are the same variety as the tree making the fruit, not that of the pollinator tree. For example, two early-season varieties can pollinate each other if neither are sterile, but an early-season and a late-season variety cannot pollinate each other because their blooming periods won't overlap. Rows of apple trees in a meadow. A combination of the right site, plenty of sunlight and proper fertilization helps encourage healthy blooming. 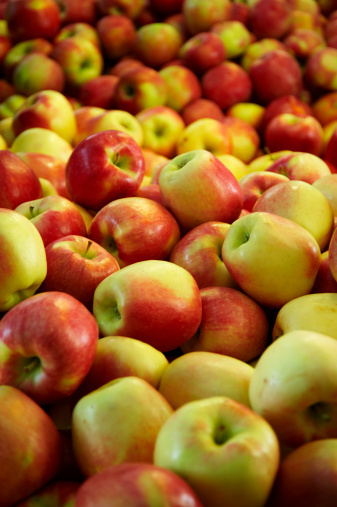 Apples grow best in moist, loamy soil in areas that receive all-day sunlight. 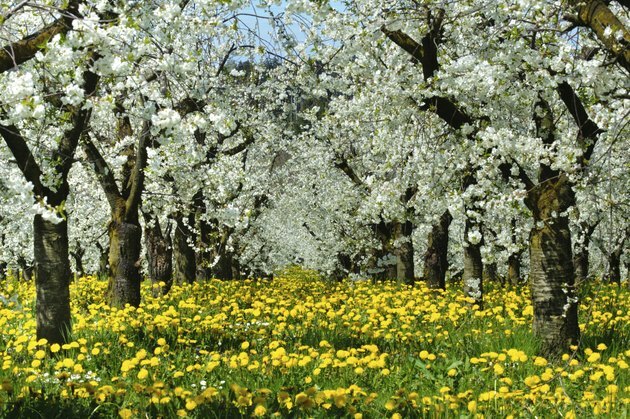 Spacing trees 15 to 18 feet apart, or 4 to 8 feet apart for dwarf varieties, keeps them close enough for pollination but prevents overcrowding. Regular irrigation that keeps the soil moist but not soggy results in healthiest bloom and fruit set. Fertilizer needs are best determined with a soil test. If you don't test the soil, make a general application of a 10-6-4 fertilizer blend annually in spring just as the buds begin to swell. Sprinkle 1/2 pound of fertilizer, up to a maximum of 7.5 pounds, for every year of tree age over the ground beneath the tree canopy, and water it in after application. A rotten apple hangs from a tree. 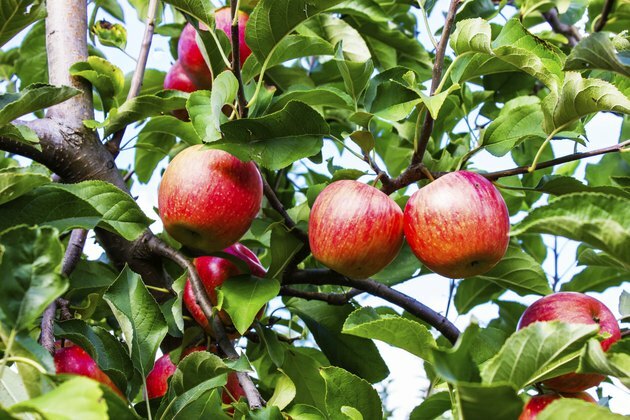 Planting disease-resistant apple varieties helps prevent the two most common blossom diseases, fire blight and powdery mildew. Fire blight causes shoots to die back and form hooked tips, and amber droplets ooze from blossoms, leaves and succulent shoots. Powdery mildew delays blossoming, and the buds become covered in a white or gray mold. 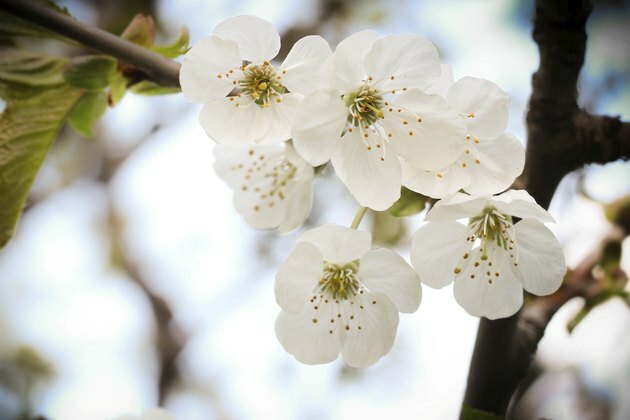 Treat by pruning out diseased branches and spraying with a treatment spray at five- to seven-day intervals, starting from when the blossoms become pink to when they drop from the tree. Treat fire blight with streptomycin spray when temperatures are above 65 degrees Fahrenheit. Spray a fungicide for powdery mildew, such as one containing tebuconazole for a total of four applications. 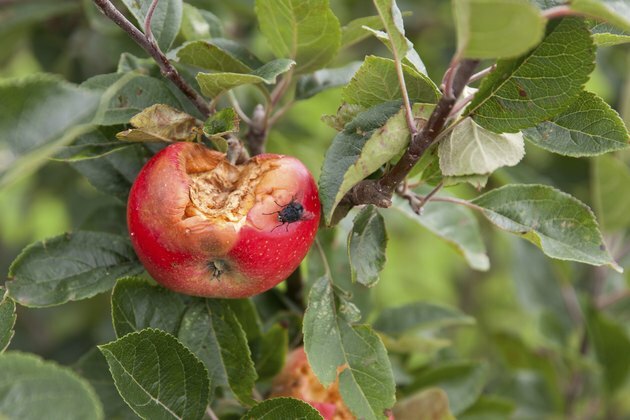 Apple-disease sprays are available in ready-to-use, premixed formulas or in concentrated formulas that require mixing with water at the label-recommended rate.